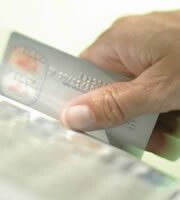 Much attention recently has focused on the traps involved with using credit cards and falling into credit card debt. But as long as you understand credit card terms, carry low balances, pay your bills on time, and keep your spending well within your budget, credit cards offer advantages that are tough to beat. Here are five reasons to hold onto your credit card accounts. Credit cards can be budget busters if you use them to buy things you can't afford. But they can also help you budget if you use them mindfully. Your credit card statement shows you exactly how much you spend each month, broken down by category, so you can see where your money goes. Sign up with your credit card company to view your statement online to help you track purchases for your weekly budget. Make your credit cards work for you. Shop for no- or low-annual fee cards that offer rewards you can use, whether that's cash back or airline miles. Pay your balance in full each month to avoid interest payments, and essentially you'll get the convenience of the credit card for free with a bonus to boot. Handling a reasonable number of credit cards responsibly helps establish a good credit history, which translates into a good credit score. Keep balances on credit cards to no more than 30 percent of your credit limit, and pay your bills on time every month to maintain solid credit. Credit cards aren't meant to replace an emergency fund for major car repairs, medical bills, and other unexpected expenses, but they can save the day until you can get your hands on the money needed to pay those bills. Credit cards are practically essential for making travel reservations, and the liability protections for unauthorized use of credit cards are stronger than for debit cards. Some credit cards offer travel-related perks, such as free travel insurance and car rental discounts, and credit cards provide the best currency exchange rate when you use them to make purchases abroad. 0 Responses to "Five Great Things About Credit Cards"